This one is an actual free pattern, but it’s as much an idea as anything. After a season of knitting for others and probably rushing through projects (that wasn’t just me, was it? ), it’s time to take it slow, to knit something for ourselves and to just enjoy the process with a project that isn’t that difficult but that will wrap us in warmth for seasons to come. 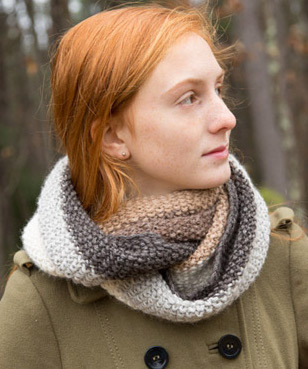 Classic Elite designer Annissa George has just the thing with her Coors Cowl (download PDF at link). Worked in five colors of a bulky alpaca/bamboo blend, it’s just wide stripes of seed stitch worked in a big loop. That doesn’t mean the result isn’t pretty, just that this is easy, satisfying knitting that will take some time but also be relaxing and enjoyable. Just the thing we all need right around now. Bonus: you might be able to make this a stash-busting project if you have enough yarns of similar weight. Or use whatever weight you have to make a big loopy cowl in whatever stitch you like. See: a great idea. Or several. I have actually made another similar scarf with bigger yarn and larger needles. I didn’t use a pattern. What I am trying to figure out is how long to make the infinity scarf. I didn’t make it with circular needles, but the other way around and it’s almost finished. How long would you make it? I would probably make it about as long as you’d make a scarf, then just sew the ends together. That way you have something you can wrap around a couple of times if you like or wear as one long loop. Me likey mucho!!! Thanks for sharing Sarah!